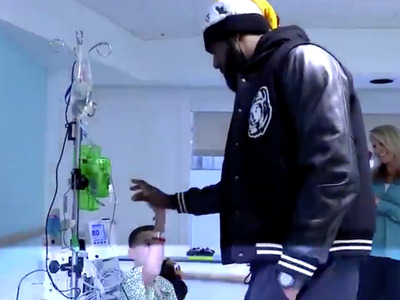 LeBron James visited a local Cleveland hospital on Wednesday to meet with fans and spread holiday cheer. One young fan named Andrew asked for James to dunk on Lonzo Ball for him, which James promised he’d do his best to make happen. The Cleveland Cavaliers and the Los Angeles Lakers play on Thursday night, giving James the chance to make good on his promise to Andrew. LeBron James got a somewhat odd Christmas request from a fan: a monstrous dunk on Lonzo Ball. The room burst with a bit of laughter before LeBron was able to get out his reply. TMZ Sports got video of the request, which you can watch below. The Cavaliers host the Lakers tonight in Cleveland, so Andrew could very well get his wish should LeBron take flight and Lonzo be too slow to move out of the way.